Keeping your dog clean is an important part of caring for your dog. A dirty dog is not only gross for you, but it’s also bad for them! Clean, nice-smelling dogs are happier, healthier, and more fun to around. Bathing is a huge part in your dog’s cleanliness, but to truly keep your dog clean and smelling nice, you need to do more than just that. What your dog eat changes the way its body works. If you’re feeding your dog things that are bad for them, like many of the ingredients that make up commercially made dog food, its body won’t work properly, and your pup will end up smelling bad as a result. Additionally, your dog could be allergic to the preservatives and ingredients in its dog food, resulting in flatulence, and over ball bad odor and uncleanliness. To avoid this, make sure to feed your dog high-quality dog meals from subscription serviced like Ollie, so your pup stays clean and nice smelling! Regularly grooming your dog not only helps them to look good, it helps them smell good, too! When you brush your dog, you help to remove dirt, dead skin, hair, and other debris that get stuck in your dog’s coat in between baths. When you don’t brush your dog enough, this debris can cause bad odor, along with sometimes activating your dog’s immune system, resulting in allergies for your pup. 3. Clean your dog’s ears. Dog’s ears come in all shapes and sizes, but in general, they’re pretty big. Dirt and debris can be easily caught inside of your dog’s ears, causing bad odor and sometimes even infections. Your dog’s ears should be cleaned once a week. Ear cleaning materials are usually found at pet stores, and are easy to use: all you have to do is gently rub the inside of your dog’s ear to break up ear debris. However, be careful of your dog’s ear canal, and be sure to always wipe away any leftover moisture in your pup’s ears! 4. Keep your dog’s mouth clean. Dog breath is a huge contributor to bad odor in dogs and can be caused by a variety of things. Part of your dog’s bad breath comes from what they eat, and part of it comes from having an unclean mouth. To clean your dog’s mouth, you can brush their teeth using dog toothbrushes and toothpaste, or you can choose to feed them dental chews that both clean their teeth and give them something to do. Both options help to cut down on your dog’s bad breath and odor. 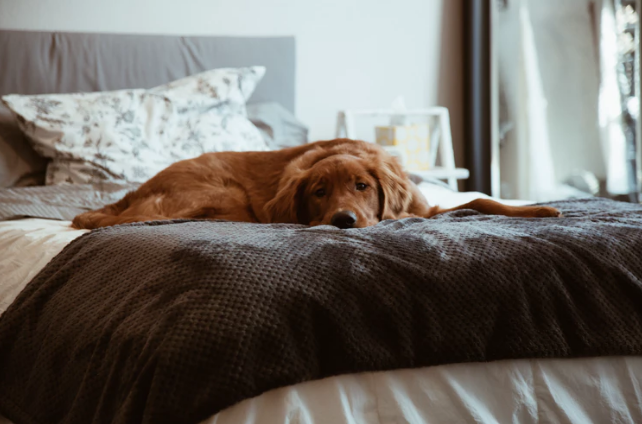 An easy way to cut down on bad dog odor is to regularly clean their bedding. This will not only help your dog but will make your whole house smell better. Make sure to use non-scented detergents, and avoid using fabric softeners, as your dog’s sense of smell and skin are more sensitive than yours are. Your dog’s health is greatly impacted by their cleanliness, which ends up directly impacting how they smell. The largest contributor to your dog’s cleanliness and the smell is its diet, which is why you should make sure to feed your dog fresh food from companies like Ollie. Regularly performing these five activities can help improve you and your dog’s quality of life, so you can comfortably snuggle without any worry of puppy stink or bad dog breath. Christin Lee is a yoga instructor, entrepreneur, and lifestyle blogger living in NYC with a passion for universal human rights. She currently writes for InsiderEnvy, a site focused on travel, health and pet care.